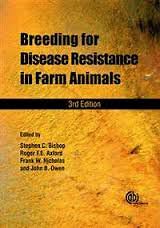 Addressing principles associated with breeding animals for enhanced health and resistance to specific diseases, this new edition provides an updated review of the field and is illustrated with examples covering many diseases of importance to livestock production across all major livestock species. Authored by experts in the field, the book covers techniques and approaches, viruses, TSEs, bacteria, parasites, vectors, and broader health issues seen in production systems, including metabolic diseases. The book will be an essential reference for professionals in the field, scientists and researchers, students, breeders, vets, agricultural advisors and policymakers.